The Terrestrial ECOsystem (TECO) model evolves from its precursor model TCS [Luo and Reynolds, 1999]. It is a process-based ecosystem model and designed to examine critical processes in regulating interactive responses of plants and ecosystems to elevated CO2, warming, altered precipitation. TECO has four major components: canopy photosynthesis, soil water dynamic , plant growth (allocation and phenology) , soil carbon transfers. Schematic presentation of TECO model. A. Canopy model; B. 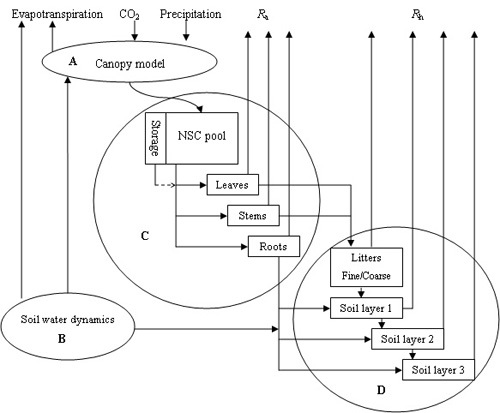 Soil water dynamics model; C. Plant growth model; D. Carbon transfer model. Rectangles represent the carbon pools. Soil is stratified into three layers. Ra: autotrophic respiration. Rh: heterotrophic respiration, NSC: non-structure carbohydrate. The canopy photosynthesis and soil water dynamic sub-models run at the hourly time step. The plant growth and soil carbon sub-models run at daily time step. The detailed description of the TECO model is in the appendix. Here is a brief description. The canopy photosynthesis was simulated by a multi-layer process-based model, which mainly evolves from the model developed by Wang and Leuning . It simulates radiation transmission in the canopy based on Beer’s law. Foliage is divided into sunlit and shaded leaves. Leaf photosynthesis is estimated based on the Farquhar photosynthesis model [Farquhar et al., 1980] and a stomatal conductance model proposed by Ball et al. . The soil water dynamic sub-model stratifies soil into ten layers. The thickness of the first layer is 10 cm and 20 cm for the other 9 layers. Soil water content of these layers is determined by mass balance between water influx and efflux. The water influx is precipitation for the surface layer and percolation for deeper layers. The water efflux includes evaporation, transpiration, and runoff. Evaporation is mainly controlled by the moisture of the first soil layer and evaporative demand of atmosphere. Transpiration is regulated by stomatal conductance, soil moisture, and root distribution. The plant growth sub-model simulates carbon allocation and phenology following ALPHAPHA model [Luo et al., 1995; Denison and Loomis, 1989] and CTEM [Arora and Boer, 2005], respectively. Allocation of assimilated carbon among the leaves, stems, and roots depends on their growth rates, and varies with phenology. Phenology is represented by annual variation of leaf area index (LAI). Leaf onset, the start of a growing season, is determined by growing degree days (GDDs). Leaf senescence is induced by low temperature and low soil moisture. When LAI is below a certain level (LAI<0.1), the end of growing season comes. The carbon transfer sub-model considers the movement of carbon from plant to soil through litterfall and the decomposition of litter and soil organic carbon [Luo and Reynolds, 1999; Barrett, 2002]. In this sub-model, a soil profile is divided into three layers with carbon movement from upper to lower layers. Carbon inputs to the soil from root growth and dead root residues are partitioned into these three layers. Weng, E. and Luo, Y., 2008. Soil hydrological properties regulate grassland ecosystem responses to multifactor global change: a modeling analysis. Journal of Geophysical Research – Biogeosciences, doi:10.1029/2007JG000539.